We all know that it begins on location, in the camera and with a great capture. However, that is just the beginning. Vogel says, “It takes more than a camera to create a great photograph.” It was true when we processed photographs in the darkroom and it is still true today with digital processing. In this presentation, Vogel will guide the group through the “Visualization Process” with ‘special guest’ Ansel Adams. 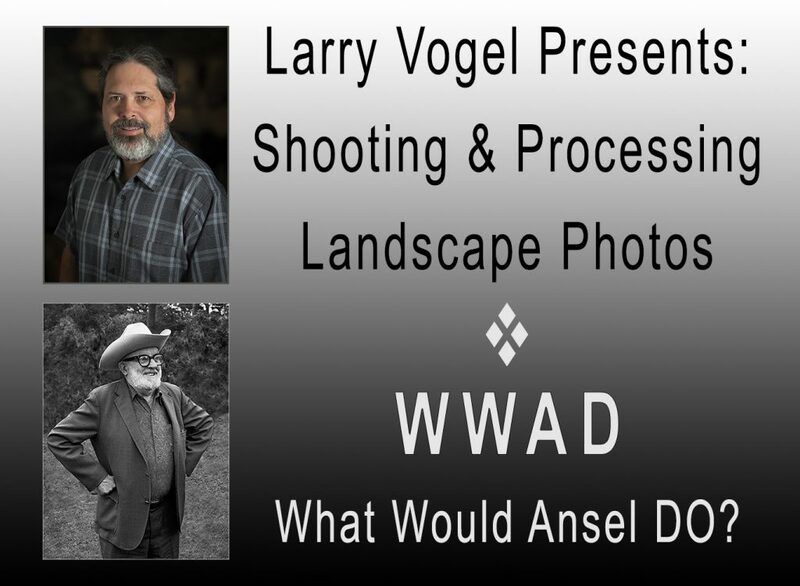 In addition, Vogel will demonstrate creative, yet simple digital techniques that will help to raise your average landscape photographs to a higher, award winning level. Larry Vogel has been a fine art photographer for over thirty years. Vogel has exhibited his work since 1979 and has been included in more than fifty exhibitions, including shows at: Susan Spiritus Gallery in Newport Beach, CA, The Ansel Adams Gallery in Yosemite, California, and the Africus, Johannesburg Biennale in 1997. Vogel has over 25 years of experience teaching workshops and leading photographic organizations. He has created and directed several photography groups based on the image critique process. He continues to offer his expertise in the critique process and has been sought out as a judge and instructor for many camera clubs, art groups and county fair organizations. Vogel has been an exhibiting fine art photographer for more than 30 years. He is currently represented by the Susan Spiritus Gallery, Newport Beach.